In a one-to-one ratio; Calcium and Magnesium are two of the most essential minerals, vital for maintaining healthy bone density, relaxation of muscles and many other functions. This Calcium and Magnesium formula provides equal amounts of both minerals from highly bio-available True Food cultures and Sea Calcium seaweed complex (Lithothamnion calcarea). As a guide, much less True Food Calcium and Magnesium is needed than from standard inorganic Calcium and Magnesium supplements. Calcium is essential to maintaining your total body health. Your body needs it every day not just to keep bones and teeth strong over your lifetime, but to ensure proper functioning of muscles and nerves. It also helps your blood clot. Magnesium is the fourth most abundant mineral in the body and is essential to good health. Approximately half of your body`s magnesium is found in bone. The other half is found predominantly inside cells of body tissues and organs. Only a small amount of magnesium is found in blood. Magnesium helps maintain normal muscle and nerve function; it keeps your heart rhythm steady, supports a healthy immune system and keeps bones strong. Magnesium also helps regulate blood sugar levels, promotes normal blood pressure, and is known to be involved in energy metabolism and protein synthesis. CONTAINS NO added sugar, salt, wheat, gluten, lactose, dairy products, artificial preservatives, colours or flavourings. Proprietary mixture: magnesium chloride, calcium chloride with enzyme digested Saccharomyces cerevisiae (with soya); natural Lithothamnion calcarea, bulking agent: hydroxypropyl cellulose; anti-caking agent: magnesium stearate*; anti-caking agent: stearic acid; anti-caking agent; coating: methylcellulose, glycerine, natural vanilla flavour (agave syrup; flavour: vanilla extract; colour: caramel). All True Food nutrients also contain B vitamins, beta glucans, glutathione, choline, inositol, amino acids and other phytonutrients naturally found in fermented food cultures. Adults take 2-6 tablets (children over 8 years, 1-3 tablets) a day, with or between meals, or as your health professional advises. Food supplements should not be used as a substitute for a varied and balanced diet and lifestyle. Below are reviews of True Food Calcium & Magnesium - 60 Tablets by bodykind customers. If you have tried this product we'd love to hear what you think so please leave a review. Question about True Food Calcium & Magnesium - 120 Tablets Are the True Food supplements suitable for those with an intolerance to yeast? Question about True Food Calcium & Magnesium - 120 Tablets Are the nutrients in the True Food range synthetic? Question about True Food Calcium & Magnesium - 120 Tablets Is the calcium - calcium citrate or calcium carbonate? The True Food range of supplements are bio-transformed within the lab to a form that is recognised by the body as food. We naturally recognise our vitamins and minerals in food and so by offering the nutrient in this form it is thought to be more bio-available. This means our True Food calcium and magnesium are not bound to anything (such as citrate). Usually the mineral is bound to a carrier to increase absorption. Question about True Food Calcium & Magnesium - 60 Tablets Are the True Food supplements suitable for those with an intolerance to yeast? 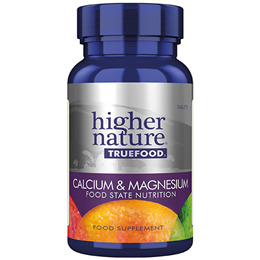 Question about True Food Calcium & Magnesium - 60 Tablets Are the nutrients in the True Food range synthetic? 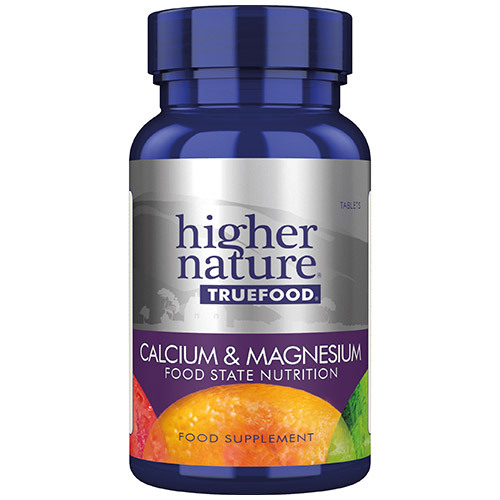 Question about True Food Calcium & Magnesium - 60 Tablets Is the calcium - calcium citrate or calcium carbonate? In a one to one ratio Calcium and Magnesium are two of the most essential minerals. They are vital for maintaining healthy bone density, relaxation of muscles and many other functions.